A fastcraft bound for Tubigon from Cebu City and a cargo vessel accidentally collided in waters at the vicinity of the accident prone Lawis Ledge off Talisay City on Thursday night. 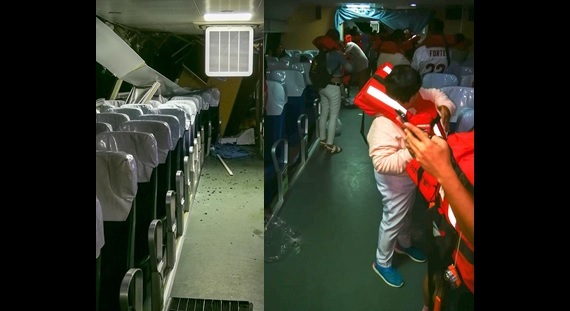 The M/V Ocean United at around 8:45 p.m. hit the rear end of FastCat M11 which had 70 passengers on board and 12 rolling cargoes, a Philippine Coast Guard (PCG) report said. According to the PCG, three of the FastCat passengers were injured with one of them rushed to a hospital for immediate medical attention. The Fastcraft was able to safely return to Pier 3 in Cebu City at around 9:30 p.m. while the M/V Ocean United was directed to be moored at the port’s anchorage area. Both vessels were placed under the custody of authorities pending an investigation and safety inspection, the PCG said. A seven-man PCG environmental protection team deployed to the site of the accident noted that there were no indications of oil spill in the area. Earlier, authorities pinpointed Lawis Ledge as a disaster-prone area for vessels. It has been described as a narrow passage with rocks on both sides and has a strong current. Passenger ship St. Thomas Aquinas collided with a cargo ship as it passed through the narrow strait in 2013. ABS-CBN in a 2013 report said that Trans Asia 9 ran aground in Lawis Ledge that year, while in 2011, three people died after a fastcraft also sank in the area. In January, 2018, the M/V Lite Ferry 20 which was bound for Bohol was hit by a cargo vessel at the same area resulting to minimal damage on Lite Ferry’s sun deck.